Contemporaneous lightly edited notes from the Project CHARM conference at the British Academy, Carlton House Terrace. Venue: British Academy, Carlton House Terrace, London. Three separate studies in the CHARM project were described during the proceedings. AGW => radical changes in rich world consumption patterns. Consumption not just purchase. It is ineradicable, beneficial, environmentally harmful. Assuming tech won't solve the problem. So do we consume less or differently? Strategies for changing behaviour: economic, social pressure, regulation, edu. Not resoundingly successful because ltd understanding of consumption dynamics. Behavioural economics relies on steering and conditioning, not rational actors. Nudge assumes that automatic/habitual/unconscious behaviour most important. CHARM is trying to find our which interventions work and on what scale. Home Energy Study... Feedback on domestic electricity consumption. Data collected with current-clamp meter and aggregated on central Web site. Took initial 2 weeks of baseline consumption readings. Compared control (no feedback), individual feedback, individual + social norms. Hourly usage graph was salient even if vertical scale (kWh) was opaque. 3% (not significant) reduction w/ feedback: would need larger sample. No difference between individual and social norms. People we more interested in emails than Web site. Social norms group looked at graphs more. More viewing of tips correlated with reduced consumption. Discourse: often money is conventional; an important one is waste. *** People more motivated by frugality (avoiding waste) than thrift. Counter discourses: personal prefs, upbringing, ID, social expectations, etc. 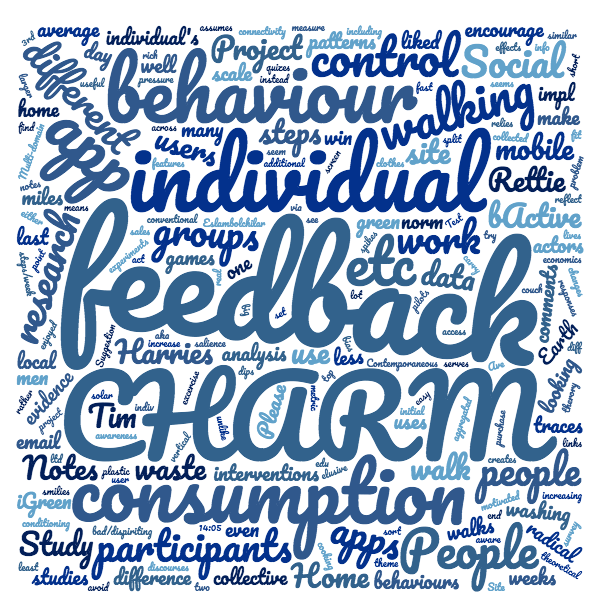 CHARM feedback made people more aware of waste and consumption. Smart meters may benefit from email/Web feedback, and *hourly* trend data. Q: even people claiming that they were different to the norm (eg we're a big family), took notice of norms at least some of the time. Fun, easy to use, light-hearted to fit FB environment. In 2007 FB allowed 3rd party apps. FB has some green games, but few green apps. Good for samples of elusive groups such as young men. Little existing research uses apps. Aim to test social norms approach. Give users same quiz 7 times over several weeks to see how answers changed. Groups: control, individual feedback, individual and norms feedback. Typical Q: How many of your clothes did you re-wear before washing? No evidence that either sort of feedback helped. Did the games and asking the Qs change behaviour? Not all users were driven to download it because of the theme. Prizes may broaden the appeal. The item on bottled water encouraged the "wrong" behaviour, ie drinking more bottled water and increasing plastic use. Most people have smartphones, which are loaded with sensors (accelerometers, GPS, etc, etc) and data connectivity and easy/convenient user access. bActive makes use of these features. Did the smartphone app encourage participants to walk more? The app was always on (to measure *all* walking), unlike some similar apps. Project required (the all male cohort) to carry their phone in a pocket. Same 3-way split for control / feedback as other two. Social norms as before showed participant compared to average and to top 20%. 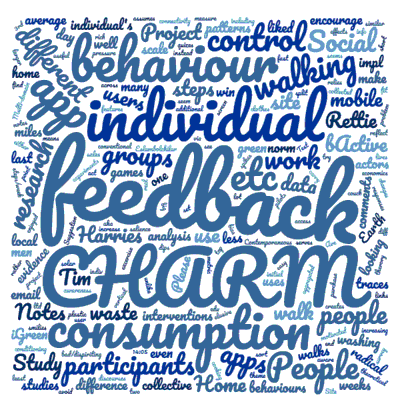 Feedback groups took 39% more steps than control. Attr by participants to more short walks (43%) walk instead of car/pubtr (35%). Type of feedback did not seem to make a difference. Walking is just a means to an end: no awareness. "Walking is not excercise!" Measuring walking was interesting to participants. Nominal 10,000 steps/week target, but users set their own, and day by day, etc. Calories bad/dispiriting metric because a lot of steps to burn many! Once working is a goal, then the incidental walking gets appreciated. Also participants try to make up for 'bad days' looking at the "peaks and troughs" and "dips and spikes". Users enjoyed liked looking at the graphs aka "digital traces" of their lives. Motivation seems to be avoiding being a lazy "couch potato". Participants v competitive and talked about "winning" and "beating the average" and liked smilies. On days they thought that they could win they did extra steps, walked less when they didn't think they could win. People well below (norms) were dispirited and didn't want to look at the screen. Social feedback creates competition but no evidence of additional walking. Graphs were key (cross-gender across CHARM). Ave 2011 UK commute to work 9 miles. Max typical walk the work that is feasible is 1 mile. Almost no one walks to work at/above 2 miles. Women and men have significantly different travel patterns. Multi-domain research has some real advantages/insights. Test effects with same app showing different control groups diff behaviour. Design (eg UI) bias is important but not necessarily well reported/studied. People fascinated by their digital traces, and reflect on them. Both individual and social feedback are useful. There isn't a therory that combines indiv and norms. "Nudges" are there, but maybe theory weak. Kingston Business School: CHARM Project. First published 2013-02-27 , updated 2019-04-17 , rebuilt 2019-04-19 . Site copyright © 2007-2019 Damon Hart-Davis. Hosted by ExNet.